Modern Family rarely opens with a scene that embodies family harmony — that’s usually left for the closing segment, after the night’s lessons have all been learned — but this year’s Christmas episode starts with a comfy tableau. It’s a gorgeous, sunny day, and the whole family is lounging by the pool —even Stella, the scene-stealing Frenchie. But the peaceful vibe is ruined when Mitchell announces that he’s received a voice mail from Dede, canceling on them for Christmas. The whole gang gets to take swipes at Claire and Mitchell’s flaky mom and her terrible holiday newsletter (too much free verse for Manny’s taste), but her impending absence leads to a realization — this is the last day that the entire family will be together during the Christmas season. Today, December 16, 2011. On our calendar, that’s a Friday. The family that plays hooky together stays together, we guess. So Phil suggests they undertake an “Express Christmas” TM, dividing the family to scramble to put together a Christmas celebration for that very same evening. “On Dasher, on Dancer, on Prancer, on Vixen,” Phil cries, as Claire, Mitchell, Cam, and Gloria respectively walk by. Sometimes stereotyping by reindeer works perfectly. Modern Family’s new power couple is Mitchell and Alex. They’re both smart and particular and picky about what kind of tree to get. Their chemistry is so great, we’ll even let their rendition of “O Symmetry” to the tune of “O Christmas Tree” slide. When Alex mistakenly thinks that the tree salesman is trying to sell them a pink tree because her uncle is gay, she goes off on a rampage, and we agree with Mitchell: “Amazing.” This misunderstanding is punctuated by Lily, who gets to speak the first killer line of her career: a perfectly timed “I have two daddies!” Eventually, they pick a decent-ish tree and load it onto the car, only to have it fall off the rack and into traffic. Gloria is only the first driver to run the tree over, and by the time they return to the Dunphys’, they must carry it in pieces. “Cam-and-Jay. Sorta sounds like a bird.” Or like the fourth book in the Hunger Games, no? Cameron never learns. Decked out in his Christmas finery (“Based on those stains, you are the Christmas sweater”), Cam tries to have a big emotional moment with Jay. Because Cam can remember tiny details from events that happened ages ago, but he always forgets that Jay is … Jay. While they wrap, Cam presents Jay with a gift, the cork from a bottle of wine they drank when they watched their first football game together. That Jay does not remember this extremely momentous event offends Cam to a ridiculous degree: “I have a problem! I feel too much!” he cries. You said it, Cam. When Jay responds with a dismissive “put a cork in it,” we can’t help but agree. Even Stella seems perplexed. Remember those creepy commercials for Target where the woman in the red tracksuit psychotically trains for Black Friday? 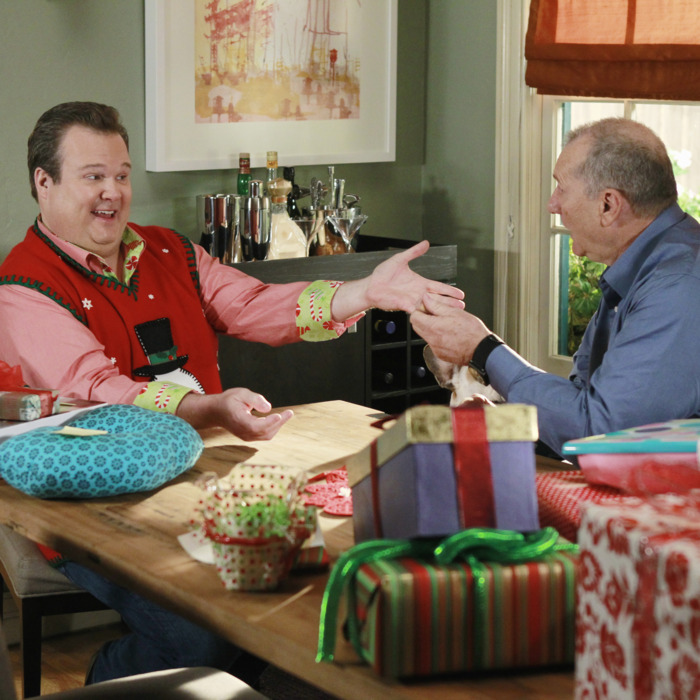 This segment — Target must’ve put a lot of gifts in Modern Family’s stocking this year — feels a lot like that. When they arrive at the store, Claire gives Haley a shopping pep talk: “Your whole life has led to this moment … Be you.” So Haley uses her “gift,” and their cart is almost full when they realize they still need a nightlight for Lily. Haley goes to get it, but a nice gay man has taken the last one. She looks slyly at the camera and follows a Target employee down a store aisle. Moments later she returns dressed in the signature red Target polo, offering the man to bring his items to the register while he shops. Hmmm. Did she like, chloroform that Target worker in the break room, or did she simply flash her bikini top? Either way, eek! Still, the scam works (“Ring her up, Madison!”) and the mission is accomplished. Manny is freaking because Luke (who is so awesome when he’s diabolical) has convinced him that child-snatching is very common, and Manny is surely next. After grocery shopping offscreen, Manny and Phil sit in a deserted parking lot and wait to procure a super-secret gift for Jay. A goony Craig’slist dude shows up with a mint condition baseball card, and when he ups the price he promised Phil, a cash-strapped Phil agrees to barter. “I’m taking the Butterball,” the scary Craig’slist guy says, which compels a paranoid Manny to whip out his mom’s stun gun. He accidentally zaps Phil. Phil reacts how any guy in a sitcom who just got tased would react. By the end, Phil is still vibrating and walking funny, the vintage baseball card is crushed, and their turkey is gone. So after the day’s adventures, the family is left with a busted tree and angel, no turkey, and both Cam and Phil have messed up their gifts for Jay. The castwide meltdown is a joy to behold, as even Phil is ready to give up on Express Christmas (see him attempt to defrost a bunch of Cornish hens via stun gun). But wait! Just as all hope is lost, Jay saves the day, luring the family outside to see the fake snow he’s commissioned to be sprayed on the Dunphy lawn. He even lets Cam hug him for four to five seconds. As the family frolics in a montage of December 16 glee, we’re reminded that on the right occasion Jay can be kinda a softy. And, of course, that the best present you can get him is dog antlers.